Jiang Mianheng, the eldest son of the Godfather-esque former Chinese communist political leader Jiang Zemin, has stepped down from a prominent role in China’s top scientific research academy. The official explanation given was “due to age reasons”—though, given that at 63 he is still a few years from retirement, the more salient climate of intense political struggle is a more ready and tempting explanation. Jiang Zemin’s political tribe, including his former colleagues, appointees, political clients, and family, has been under enormous pressure for the last two years, as Xi Jinping, the current leader, has waged war on Jiang under the guise of an anti-corruption campaign. The anti-corruption push indeed encompasses much more than the clearing out of Jiang’s men, but the purge of the Jiang clique from positions of power in the military, propaganda, security, state asset, and many other spheres, represents a sea change in the configuration of who wields political power in China. Jiang Mianheng’s resignation from the Chinese Academy of Sciences’s Shanghai branch is the latest, if relatively subtle, sign of this turning of the tide. The news was announced in a perfectly bland manner on Jan. 6 at a “reorganization meeting” of the Academy’s branch in Shanghai. 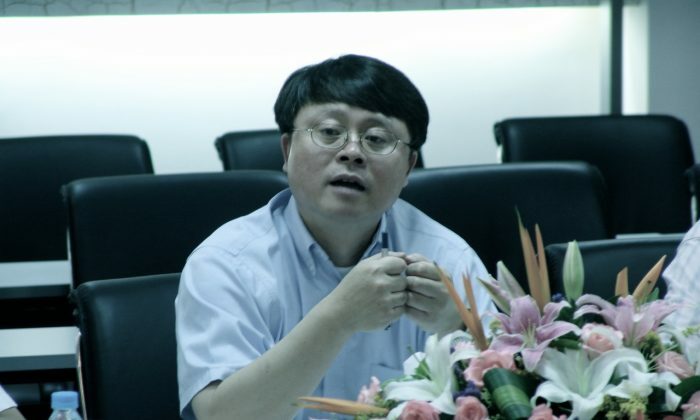 “In his speech, Zhan Yuanlong pointed out that comrade Jiang Mianheng, due to age reasons, will no longer serve as president of the Shanghai branch of the Chinese Academy of Sciences.” Zhan Yuanlong is the deputy director of the entire CAS. Jiang Mianheng was, in any case, widely believed to have obtained his positions at CAS as a result of open nepotism: he was appointed to be the deputy director of the entire academy—the largest and most prestigious scientific research organization in China—in 1999, just six years after returning to China after obtaining his Ph.D. in the United States. He had accumulated little academic research achievement or managerial expertise in the intervening period. (In November of 2011 he no longer held that post.) In 2005 he became the president of the Shanghai branch of CAS, the position that he has now relinquished. Last week Epoch Times reported on investigations into China Unicom, one of the largest telecommunications companies in China. Several key officials at the firm had been taken away for investigation. Given that Jiang Mianheng controlled China Netcom, a company that merged with China Unicom in 2008, there was the possibility that the probe was aimed at him—though this was never certain. The idea seems more plausible in light of the recent retreat from CAS. Whether all this will come out into the open with the announcement of an investigation, high-profile arrests, and jail time is still unclear. Western China hands never expected that Zhou Yongkang, the former security czar, would be expelled from the Party and hauled before a court—once his investigation was announced, however, it came to be seen as almost a natural development. There was also the matter of news about Jiang Mianheng’s father taking a walk through the mountains of Hainan being quickly purged from Chinese websites. The treatment of that news item almost gave the impression that Jiang Zemin, formerly the most powerful man in China, was a regular political enemy, or persona non grata. That would certainly be of a piece with his son’s quiet exit from the Academy.